The Notice Branch of the Delhi Traffic Police, Delhi, has achieved ISO 9001:2000 QMS Certification for "Processing, Issue of Traffic Violation Notices and Collection of Compounding Amount thereof under section 133 of Motor Vehicle Act, 1988 for Vehicles registered in Delhi". 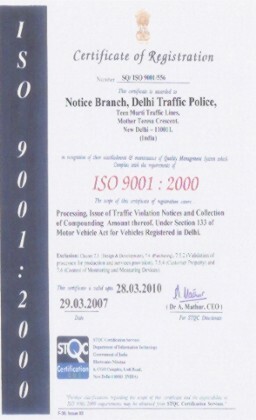 The Notice Branch of the Delhi Traffic Police is among one of the Traffic Police branch's of its kind in India to achieve ISO 9001 QMS Certification. The process for standardization and achieving ISO 9001 Quality Management System Certification for the Notice Branch started when the contract for the same was awarded to TQ Vision Consultants. Sh. G S Awana, Assistant Commissioner of Police - Traffic/Computers was nominated as the Management Representative. He was assisted by Sh. R S Gotewal, Sub Inspector - Admn/NBT. Five awareness programmes on ISO 9001 requirements were conducted by Sh. Rajeev Arora, Consultant, TQ Vision, which were attended by all the Officers and staff posted at the Notice Branch at Teen Murti Traffic Lines, R K Puram and Old Police Lines. The system documentation was drafted by TQ Vision after studying the existing systems and the requirements defined in the Motor Vehicle Act, Central Motor Vehicle Rules, Delhi Motor Vehicle Rules, Rules of Road Regulations and other relevant Orders and Circulars. The Quality Policy and the Quality Objectives were drafted and finalized by Sh. Qamar Ahmed, Joint Commissioner of Police/Traffic. The Quality Manual and the Quality System Procedures Manual were released after approval from Sh. L V Prasad, Deputy Commissioner of Police/Traffic. The Auditing Team from STQC Certification Services (Department of Information Technology, Government of India) headed by Sh. Atul Gupta and assisted by Sh. P K Das and Sh. V K Chadha was very much satisfied with the system implementation, internal auditing and management review and have identified the management commitment and internal audits as the strong areas. The Auditing Team also audited the centres located at Old Police Lines and R K Puram, Delhi for the processes carried out at these locations. The certificate was formally handed over by Sh. S L Sarnot, Director General, STQC to Sh. K K Paul, Commissioner of Police, Delhi in the presence of Sh. Madhukar Gupta, IAS, Union Home Secretary, Govt. of India at a function held at Teen Murti Traffic Police Lines on April 17, 2007. As per Sh. M S Upadhye, Addl. Commissioner of Police/Traffic, the Delhi Traffic Police has prosecuted 18,94,178 violators through the Notice Branch during the year 2006 and a total amount of INR. 4,37,98,470 was realized from violators in the form of compounding amount and court fine. 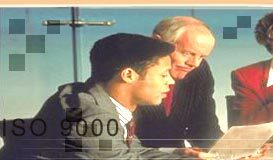 NEED MORE INFORMATION about ISO 9001 certification, Delhi Traffic Police ISO Certification, Delhi Traffic Police ISO 9001, Delhi Traffic Police ISO Consultant, STQC ISO Certificate, Delhi Traffic Police ISO Certificate, Best ISO Consultant, Government ISO Consultant, Approved ISO Consultant, Authentic ISO Consultant, Approved ISO Training, ISO Systems, ISO 39001 Road Traffic Safety Management System, ISO standatds, ISO 39001 Consultant, ISO certification meaning?